The OpenDataNI portal was officially launched on 26th November 2015, to mark this we had a birthday celebration last Friday (25th November 2016) in Belfast City Hall. We had a full house of predominantly public sector staff as we wanted to show to our colleagues what has been achieved within the first year and listen to the Finance Minister’s endorsement to encourage more proactive publication of data. The event was opened by Finance Minister Máirtín Ó Muilleoir who welcomed the achievements so far in open data and encouraged more public sector organisations to release their data. He also took the opportunity to announce that the Executive has agreed to a range of open government commitments, one of which relates to open data. 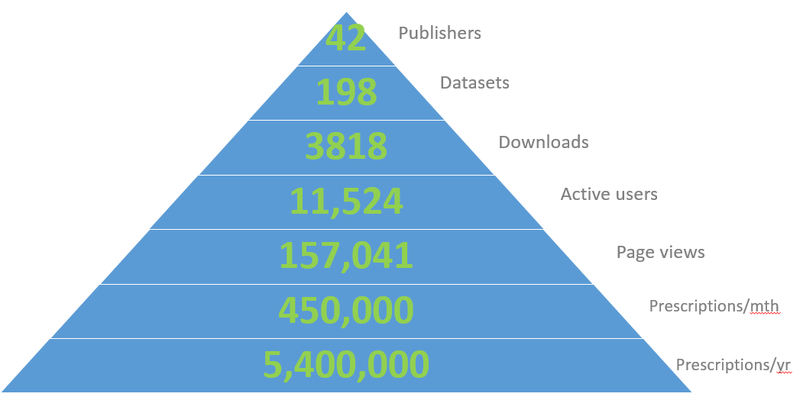 Within a year we have approximately 198 datasets published on the portal from 42 publishers. To date we have seen 3,818 downloads of datasets (to the end of October 2016) with an average of over 1,000 active users of the portal a month. 450,000 rows of prescription data are published as open data per month totalling a staggering 5.4 million rows of data per year. We then had a great talk from Dr Scott Fischaber, Chief Engineer at Analytics Engine who spoke about the insights we can obtain in health and social care from analysing the prescription data on OpenDataNI. In particular he highlighted the correlation between socio-economic status and depression. Alan Hook (Course Director and Lecturer in Interactive Media at Ulster University) outlined how he is teaching Interactive media student’s about citizenship through the use of data on OpenDataNI. Alan also advocated for data literacy to be taught in schools at secondary level as a key skill. Mike Rose, Head of Data Engagement for the Defra Data Transformation Programme joined us via Google Hangout to tell us the story of how the Department of Environment, Food & Rural Affairs (DEFRA) in England managed to release over 10,000 datasets as open data within one year. DEFRA are now aiming to become a data driven organisation prioritising their use and release of data. On Twitter @OpenDataNI trended in Belfast during the day which just goes to show the increasing interest in open data! The majority of publishing to date has happened thanks to small pockets of engaged civil servants or via members of the public using the Suggested Dataset form (a publically accessible online form where they can ask for data to be published). Now that we have tested the capacity and robustness of the portal and are seeing real evidence of the data being used we need to see more proactive publishing of data across all Departments. We are not just committed to releasing open data but also want to stimulate its use. We are already seeing real use of data on the portal as demonstrated in the 12 Showcases published on the portal which range from finding your closest bus stop to the ability to view and analyse the public trees of Belfast City Council. The Open Data for Education Challenge #ODNI4EDU jointly funded by the Department of Finance and the Department for the Economy on behalf of the Northern Ireland Digital Catapult and supported by Catalyst Inc., ODI Belfast, and Ulster University has been a huge success. From 15 entrants (all of which displayed a high degree of innovation), 6 were selected to develop a prototype, from these 2 have been selected to create a fully working teaching resource to be deployed into all primary or secondary level schools. Our Open Data Strategy is driven by its 9 principles. One of these is the use of licensing. 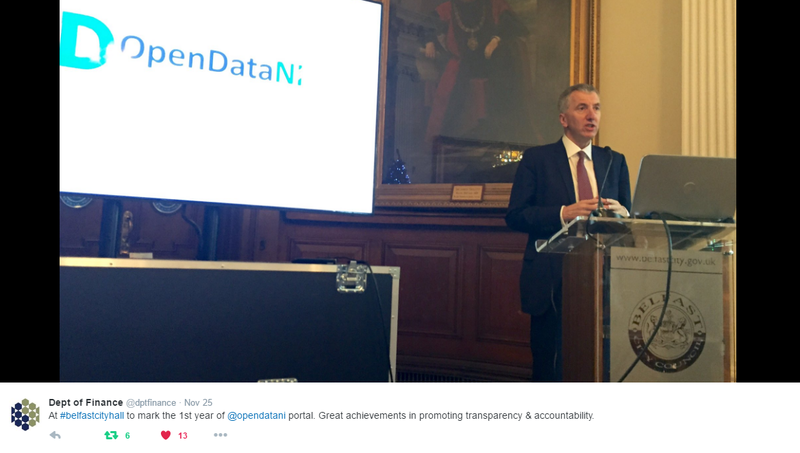 OpenDataNI is unique in that it only has one type of licence – the Open Government Licence. This gives clarity that all data on the portal is free to copy, adapt, commercially exploit and publish. Another principle also enforces publishers to put up information about the data (metadata) so that you know information such as when it was last updated, how the data was created and what the limitations of the data are. We have started to embed the principle that all new systems and services must have the ability to push out data in open formats. The release of public sector data in open data formats is an important driver for growth, job creation, innovation and transparency. We want to look to innovation and problem solving to help tackle many of the issues that we will face not just in economic terms but also issues such as an increasing aging population and its impact on existing service provision. The portal is only a year old but already we have seen some great successes, the aim is to build on these and embrace the open by default agenda. We have the potential to be a world leader in open data.